I’ve always liked this comic, but there are some times I like it more than others. I haven’t bought his book on growing up in West Baltimore yet, but this piece by Ta-Nehisi Coates is quite good. In it he discusses, among other things, the impact of having two parents who were present: he draws an analogy of “being dragged across the finish line” while growing up that I think is quite perceptive. I saw a fantastic production of South Pacific on Broadway yesterday. Although I’m familiar with much of the music from South Pacific, it’s my first time seeing it performed. The acting was lively with a convincing lead, the storyline is very good, and the music was thoroughly enjoyable. They will live a long time, these men of the South Pacific. They had an American quality. They, like their victories, will be remembered as long as our generation lives. After that, like the men of the Confederacy, they will become strangers. Longer and longer shadows will obscure them, until their Guadalcanal sounds distant on the ear like Shiloh and Valley Forge. No seriously, it’s true (via here). A new law championed by Rep. Pelosi prohibits the sale of children’s toys unless they are certified lead free. Unfortunately the requirement is retroactive, which means it applies to toys (and apparently books) already sitting on store shelves. In other words if you’re a retailer and you have a wooden toy train set made by a local craftsman in your inventory your options are 1) dispose of the perfectly good train set or 2) have the wooden set tested for lead, at considerable expense. As the article details, the law is being interpreted as applying to all children’s books published before 1985. Even as you read this, so many wonderful volumes that should be used to bring joy to the next generation are being (quite literally) tossed into the fire. I’m taking two courses this summer, both three units — which I understand is the equivalent of 12 units during the regular semester. On top of a work environment that has recently accelerated, the 14 hours a week in class keep me driving pretty hard. I measure the busyness in unread magazines. A copy of the Economist open on the coffee table, barely glanced at. Two issues of the New York Times magazine headed to the recycle bin, their glossy pages still stuck together. Two more issues of the New York Times magazine sitting unread on my coffee table like waiting friends. A third issue of the New Yorker spared the fate of its NY Times cousins, violating my “only two issues” backlog rule. All of these faithful companions, waiting so patiently for me to recover my leisure time. 1) It takes me about a full month on each end to adjust my body clock. I’m constantly looking outside and thinking it’s an hour earlier/later than it actually is. 2) Once ever few years (such as this year) I forget about the time change and show up to things at the wrong time. 3) Evening is my favorite time of day. An infant and at least four other people were shot Tuesday along a parade route packed with Mardi Gras revelers, police said. Two suspects were in custody and the victims were recovering. Beau Beals, 45, said he was outside a house party on St. Charles Avenue when the shooting erupted. He said and other partiers tossed children over a metal fence to get them to safety, but others kept waiting for beads and other trinkets being tossed from the floats as if nothing had happened. ”They had an ambulance out here picking the guy up off the street and people didn’t stop vying for throws,” Beals said. No one was shot was I was in New Orleans, but the drunken revelry was unlike anything I have ever seen anywhere else. We had guys from the ship who would wake up at 10 a.m. and head out drinking, come back around 3 or 4 p.m. and take a brief nap, before heading out at 8 p.m. to get drunk again. Today’s New York Times carries a story of graft and corruption among U. S. officers charged with overseeing projects and distributing money in the early days of the Iraq reconstruction. For those who aren’t familiar, the monetary distribution at that time was insane. From fellow government workers I’ve heard stores of forklift-ready pallets of shrink-wrapped money being loaded into cargo planes. Contractors and locals in Iraq were paid with bundles of $100 bills by folks who would walk around with their pockets bulging with cash. 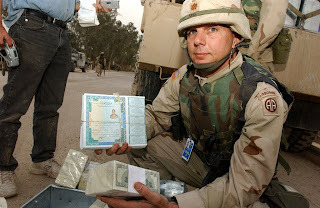 A soldier holds cash ready for distribution. Now we hear that some of the senior officers tasks with distributing these funds may have been on the take. Nobody should be surprised by this. Beyond the “in any group you’ll have a few bad apples” argument, it’s easy to see how this could happen. The temptation in any situation involving large amounts of cash is, of course, enormous. However, the real condition that predicates this is that most of the money was probably wasted in the first place – paid out in good faith for supplies or services that were never delivered. I remember a quote from someone from the Inspector General’s office, who was responded to a local construction manager’s apologies for the poor condition of a work site. “At least there’s something here,” he responded. In this situation, it’s easy to see how those distributing the money could be tempted: “If all this money is being flushed down the drain straight into people’s pockets, why shouldn’t I get my fair share?” It’s one thing to steal large quantities of money that are going to a worthy cause, but when the money is being wasted anyways it’s much easier to steal. If the allegations are true, I hope that the two officers in question will be recalled to active duty and court-martialed. Unfortunately, the military is strangely reluctant to enforce discipline in the ranks for non-violent crimes such as these. Court-martialing military members is an expensive process, and it’s often easier to avoid the hassle and let the Department of Justice handle the headache. A good example of this is a former Coast Guard warrant officer who was convicted of dumping oily waste off a Coast Guard cutter into the Honolulu harbor. This is exactly the sort of actions the Coast Guard crucifies civilian mariners for, but in this case the service declined to assert jurisdiction and court-martial the member. Instead, he was handed over to federal authorities and given a slap on the wrist.